Having exclusive use of the entire vessel allows guests to plan an itinerary to suit their personal requirements, and to match their individual interests to the varied scenery and points of interest along the river. Guests may board ‘Montar’ at a number of embarkation points. In Bangkok, we recommend Wat Choeng Lom, Pak Kret. Located only a 6-minute drive from the Stage 2 Expressway and 15 minutes from Don Mueang Airport, the temple makes a convenient, traffic free boarding point; vehicles can unload immediately adjacent to the jetty. As ‘Montar’ cruises northwards, skyscrapers are replaced by small industrial buildings and factories, with lines of barges loading and unloading at their wharves. Gradually the riverbank changes, domestic houses built almost on the water, their verandas and gazebos, reflecting the demands of the climate, in turn replace the factories. Many of these houses have become small restaurants; renowned for their excellent cuisine, they are well patronised by the Thais. If you choose, ‘Montar’ can tie up at the restaurants and you can try the local specialties. 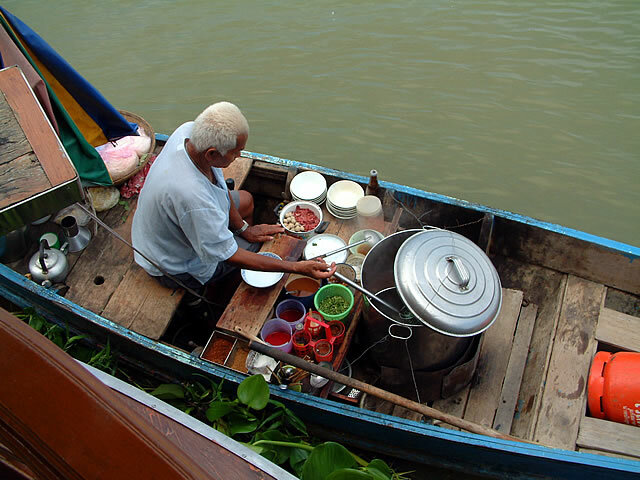 Foods being a very prominent part of Thai life, many vendors cook a variety of delicacies aboard tiny sampans on the river, selling them to passers-by. Your hostess can wave down a passing boat for you to try the freshly cooked morsels. With Bangkok disappearing into the wake, coconut palms and banana trees, interspersed with rice paddies, slip endlessly by. Afternoon tea on deck is an elegant affair, reminiscent of times long past, with sandwiches, pastries and freshly baked scones. Numerous Buddhist temples or ‘Wat’ are dotted along the river. Resplendent in lavish gold ornamentation, these are interesting places to visit. There are a number of small resorts along the riverside and as they usually have a boat landing, make convenient places to stop for the night. 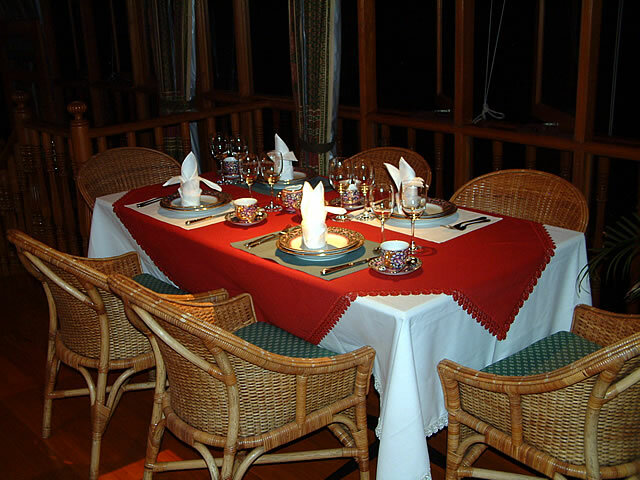 Dinner is served, at your desired time, either on board or at the resort restaurant, depending on the size of the group. The dinner is in accordance with your selection from the resort’s menu you may prefer the tropical ambience of the ceiling fans or utilise the air-conditioning. The dinner menu is in accordance with your selection. You can choose from a wide range of Thai dishes. The remainder of the evening is at your leisure; Those staying on board can feel at home in the comfortable lounge; enjoy a movie in 5.1 surround sound, digital satellite TV or karaoke; listen to music. After supper you can retire to your luxurious stateroom, with its superbly comfortable king-size bed. This ultra-stable boat will not rock you to sleep. You will awake to the sounds of chirping birds and passing boats; the river awakens at first light. A glimpse through the window reveals the river bathed in a beautiful soft light. The thick morning haze gives the rising sun a unique yellowish hue, which delights the camera; the shadows are tinged with mauve, whilst sunlit objects have warm golden highlights. The best photographs of the river are taken at this time. The delicious aroma of your favourite freshly baked bread and espresso coffee will entice you to the upper deck to enjoy your personally selected breakfast menu. Before long, ‘Montar’ is again heading upstream towards the Thai Arts and Crafts centre, and it’s associated Traditional Thai Village ; here you can purchase a wide range of beautiful Thai craftwork at reasonable prices. A further hour’s cruise brings you to the beautiful summer palace at Bang Pa-In, where you can enjoy a relaxing stroll through the palace grounds noting the architecture, a mix of classical Thai together with some impressive Chinese and European styled palaces. The appearance of the gigantic ‘chedi’ at The Temple of Auspicious Victory signals our approach to Ayutthaya. 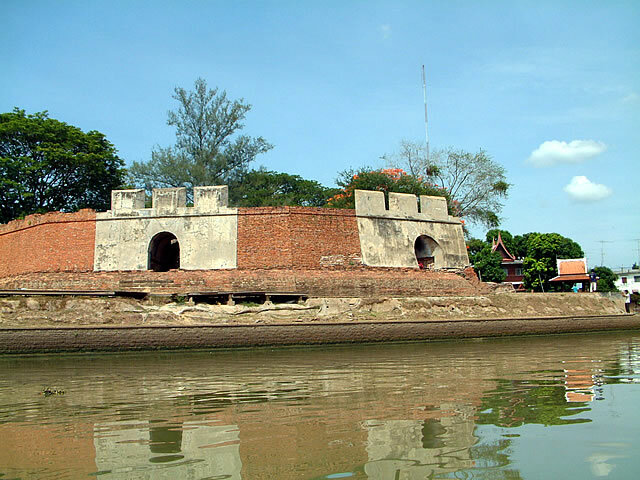 Rounding a bend in the river, we are confronted by the massive fortifications of ‘ Pom Phet ‘, the artillery battery which formerly guarded the port of this ancient river capital. Once filled with foreign sailing ships, the port area is now occupied by old rice-barges that are inhabited by friendly river folk, the newer steel barges, which today carry the river trade, and the brightly coloured tugboats which tow them. Located next to the Sricharoen Shipyard are the remains of the Dutch Settlement, where ships of the Dutch East India Company anchored 400 years ago. Although Ayutthaya is rich in sightseeing and well-maintained historical sites, there are relatively few foreign tourists here. Many people operate long-tail boats, motorised sampans, barge cruises and floating restaurants, so there is a variety of ways to see the river life. 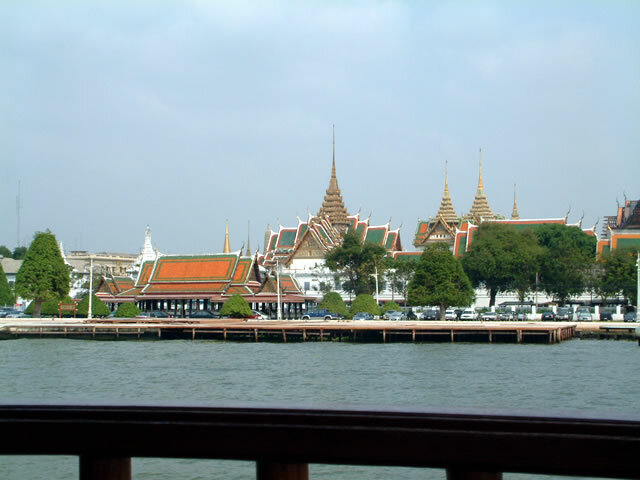 According to your choice, you can stop at Ayutthaya or continue up the Chao Phraya or Pasak Rivers. You may like to peruse the suggested Cruise Itineraries, River Attractions and The River of Kings pages for more details and information.